Semaphore Display have been a leading manufacturer of high quality signage solutions for over 34 years. A new exciting position is now available for an experienced sign fitter to join our dynamic team. Semaphore offer clients the complete design, manufacture and installation service, and we pride ourselves on quality and service. The successful candidate will be a key member of the team and will require excellent communication skills. Having a positive enthusiastic “can do” attitude is a must. Having a minimum of 2 years experience in the production and installation of all types of signs, vinyls and exhibition graphics is paramount, you will be working with a variety of substrates and will require experience in operating plotters, large format printers, flatbeds and laminating equipment. You will be required to hold a current UK drivers licence, CSCS & PASMA, IPAF industry qualifications will be desirable. Having a good knowledge of Health & Safety practises and understand the importance of the safe handling of materials will be important in this role. Excellent rates of pay, contribution company pension and bonus available. 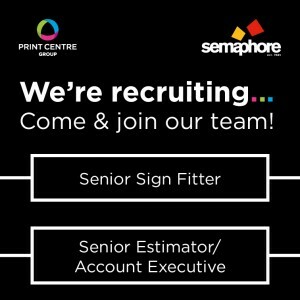 If you are interested, please click here to apply or email mark@semaphoredisplay.co.uk. We are seeking an experienced and determined individual to join our team who has a passion to deliver the highest level of customer service. Although not essential if the applicant has any transferable sales/accounts this would be an advantage and reflected in the salary offered. The candidate must be highly motivated and able to work under pressure in a fast paced dynamic environment. A minimum of 2 years’ experience as an estimator/account executive or similar within the print or signage industry is required. 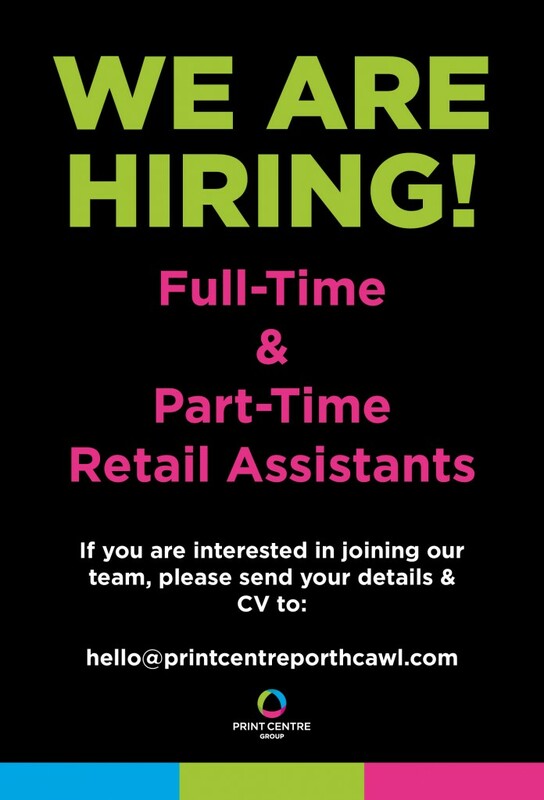 You also must have excellent communication and customer service skills and have experience working with print or signage MIS systems. Being organised, great time management skills and be a logical thinker is ideal for this role. This is an exciting time to come & join our growing sales & estimating dynamic team. 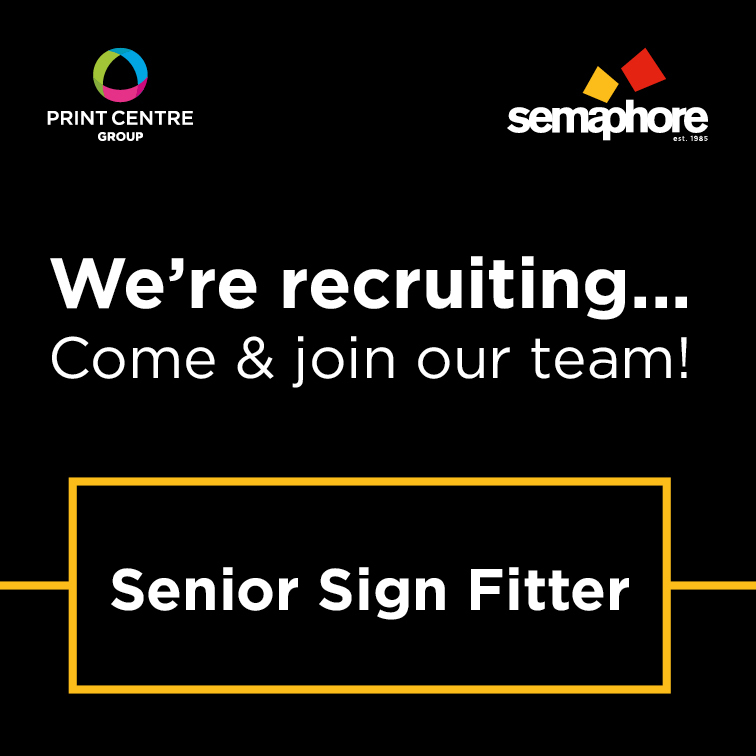 As part of the Print Centre Group, Semaphore are looking for a full time skilled Sign fitter to work in our busy signage department. The main duties of the post include the preparation and application of vinyl cut graphics for vehicles and signage. Installation experience is a must, which includes the fitting of full-colour vinyl, especially fitting vehicle wraps which Semaphore produces in-house. Experience in on site fitting and sign preparation is required. This entry was posted in News, Uncategorized on January 18, 2019 by admin. 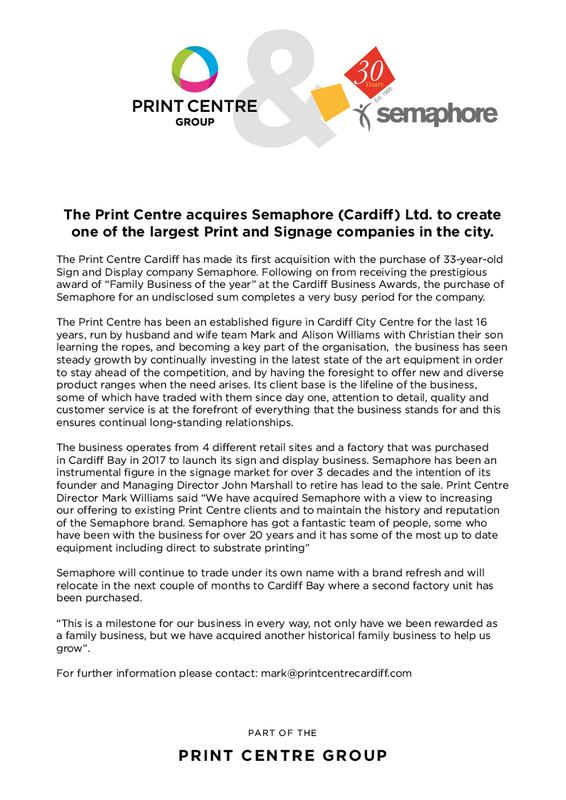 BIG NEWS for The Print Centre! To visit our new partners work & projects, click here. The winners story at the Cardiff Business Awards! We are so proud of our award and achievement of being the “Family Business of the Year 2018”. We aim to keep up our high standard for our products & services with our valued customers. Take a look at the winners story at the Cardiff Business Awards 2018. Click here. This entry was posted in News on June 26, 2018 by admin. The successful candidate will be an outgoing, personable and enthusiastic person with good communication skills and a real desire to make a difference. Accuracy, organisation and attention to detail will be paramount to being considered for this role. • To ensure that The Print Centre Group maintains a high profile and excellent relationships with our existing and new clients. • Write proposals and presentations in response to briefs. • Develop client relationships both existing and new. • To proactively grow our client base by identifying and contacting potential new clients, and keep them up to date with new services and products offered by our group. • Arrange presentations to introduce our services and assess client needs. • Ensure all introductory meetings are followed up, carrying out any actions discussed. • To adhere to all pricing structures as directed by the relevant Head of Sales. • To ensure that you are conversant with and know how to use all relevant computer systems and IT. • To be aware of our competitor’s strengths and weaknesses. • A proven ability to sell in ideas and concepts. • Great presentation skills – verbal and written. • An ability to build on and develop strong client relationships. • Ability to plan and manage your own workload. • Ability to prioritise and meet deadlines. • Proactive attitude to find new clients. • Understanding of signage and large format products and its marketplace. We are the ‘Family Business of the Year’ 2018! We are proud to announce that we have been awarded ‘Family Business of the Year 2018’ by the Cardiff Business Awards. We are extremely proud of this achievement and would like to thank our brilliant customers for helping us grow into the company we have become. Many thanks for doing that for me, very impressed with speed of service and quality, will definitely use you again both for work and for any contract work I get!